Community Lower School celebrated its first Harvest Day on Monday, October 30 th . Many of the students came dressed as their favorite character from either a book, movie or television show to add to the celebration of the afternoon. The students had a fun filled afternoon with activities and crafts provided by the Parents Association. The front entrance way was adorned with colorful scarecrows that had been decorated by each homeroom. The students, separated into teams, spent their afternoon split between the gymnasium and their classrooms. The gymnasium was festively decorated with hay bales and pumpkins and was transformed into a beautiful fall wonderland. 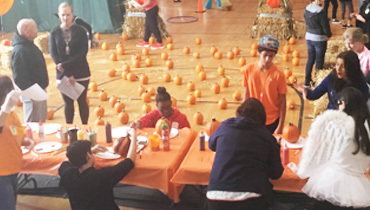 The students were able to pick pumpkins and decorate them and play a variety of fun games that included a pumpkin obstacle sweep, jack o lantern bean bag toss and bobbing for marshmallows. They also spent time working on fall themed crafts in their classrooms. It was a great afternoon enjoyed by all. 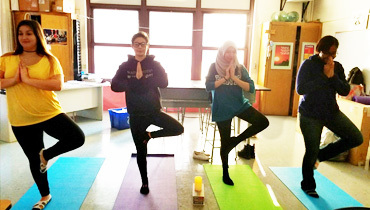 Transform your body, mind, and spirit with CHS’s newest elective: Yoga and Mindfulness. This class incorporates Yoga postures with breath work, Mindfulness methods, and a Meditation practice, giving students useful tools to integrate into the real world. 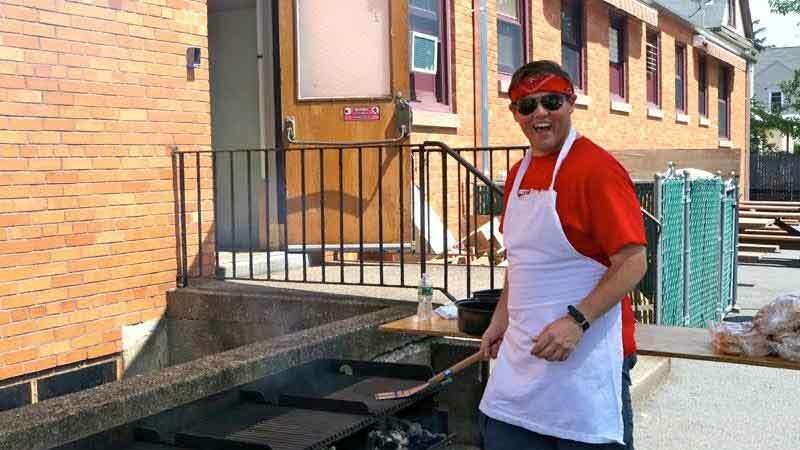 The CHS Parent's Association sponsored the End of the Year Barbecue. Students and staff feasted on hamburgers, hot dogs and of course, a visit from the ice cream truck! We all came together to celebrate another great year at Community High School. Thank you Parent's Association! On Thursday, June 8th, the Senior Class along with their Senior Advisors and Toby Braunstein, the Director of Education, enjoyed a luncheon at Houlihan’s in Paramus, NJ. After many long months of resume writing, filling out college applications and composing essays, this was a great way to end the year! The CHS Parents Association treated the group to a tasty lunch and even tastier dessert. Everyone had a great time eating, talking and laughing. Congratulations to the Class of 2017! Many group 2 students at the Lower School are interested in making positive changes and improvements within their school and communities. They wanted a chance to openly express their concerns and possible solutions, and so the “Group 2 Committee” was formed! 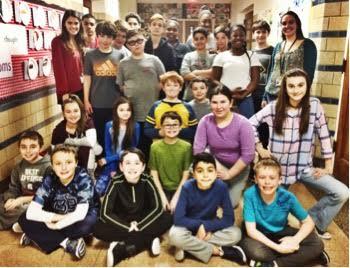 Group 2 teachers, Ms. Giammaria and Ms. Bischoff, oversee this voluntary club that meets every Friday during lunch to give students a chance to collaborate in a social environment. So far this year, the Group 2 Committee has organized school-wide events such as Pajama Day and Career Day. These charitable events have helped raise money for the Community School (students will discuss how to allocate these funds). 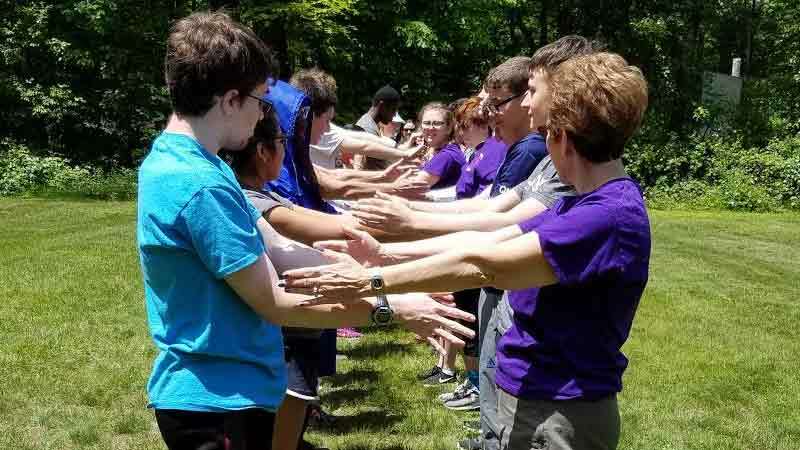 The Group 2 Committee is a fun way for students to unite and actively work together to make positive changes, create a community atmosphere, and practice team building skills. The 26th Annual Community School Fashion Show and Benefit, sponsored by our dedicated Parents Association, was a night to remember for all our Community High School models, families, friends and teachers. It was a terrific opportunity to watch our students shine on the runway. Once again, the Rockleigh Country Club in Rockleigh, New Jersey was the perfect venue for a special night full of hors d’oeuvres, basket raffles, super prizes, beautiful music performed by our students, 50/50s, a sit-down dinner and more. The most rewarding part of the evening was watching the pride in our students’ faces as they walked the runway and showed off beautiful clothes from local stores in front of approximately 145 attendees. 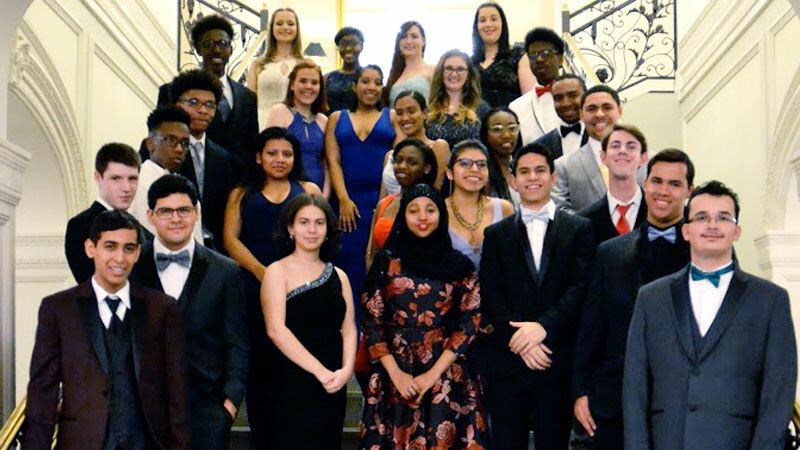 Our juniors and seniors were dressed from head to toe in formal attire from Laundry by Shelli Segal and Biltmore Tuxedos. They all looked spectacular, and Community High School is immensely proud of our stunning student models. 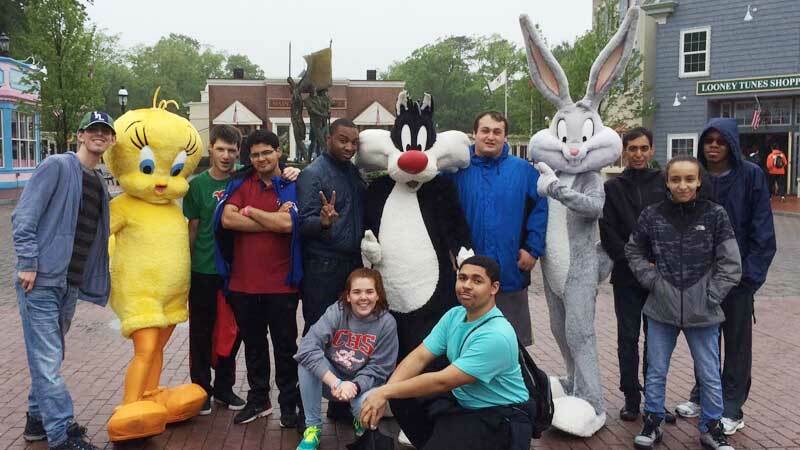 The rain didn’t dampen the spirit of the Class of 2017 when they traveled to Six Flags Great Adventure for their much anticipated senior trip. El Toro, Nitro and Bizzaro were a few of the coasters the seniors were seen on. Those who braved the rides were rewarded with short lines and big thrills. The class of 2017 was also spotted next to the fountain dancing with Bugs Bunny, Tweety Bird and Sylvester the Cat. On the Off Road Adventure, memories were made when the seniors were able to get up close and personal with the resident giraffes- even getting the opportunity to hand feed them! Each year, the graduating class looks forward to spending time celebrating their last few weeks together as the class of 2017. For our annual Yearbook trip, we went to One World Trade and toured the museum. It was an emotional experience, but the students enjoyed it immensely. We walked around the area, saw the Oculus, the reflecting pools, and took in the sights of the city. We then walked down the waterfront to Battery Park where we took some photos and enjoyed the beautiful day. While at Battery Park, the students rode the Seaglass Carousel. The carousel is gorgeous, and we all had a wonderful time. Thank you to the CHS Parents Association for sponsoring the Yearbook Trip. After a year of hard work, we would like to recognize our United for Service members. Pictured above are just a few of our dedicated students.They have participated in the Englewood Walk for Awareness (Breast Cancer Walk), the food and coat drive, benefitting two local charities, including the Englewood Center for Food Action. Also, the UFS students organized the Mother's Day Plant Sale, which raised money for the CHS Student Activities Fund. 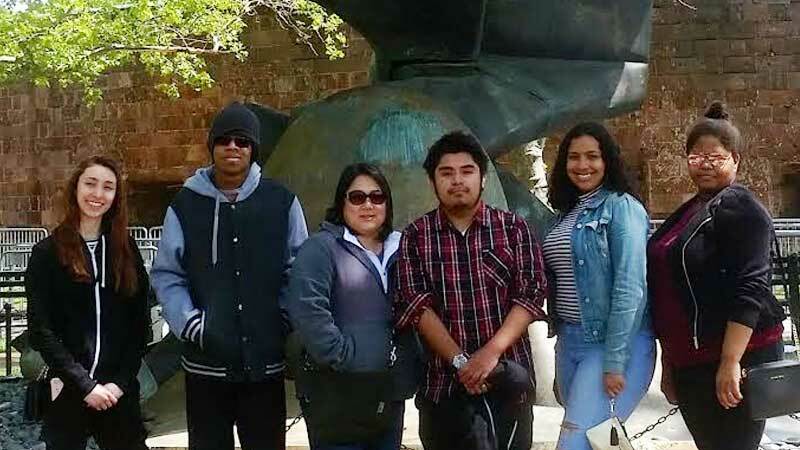 They have also been active members in the weekly UFS club meetings and have taken their volunteering spirit and efforts outside of the school of their own volition. We are very proud of all of the students who participated in the UFS Club this year and we hope that all underclassmen will return next year. 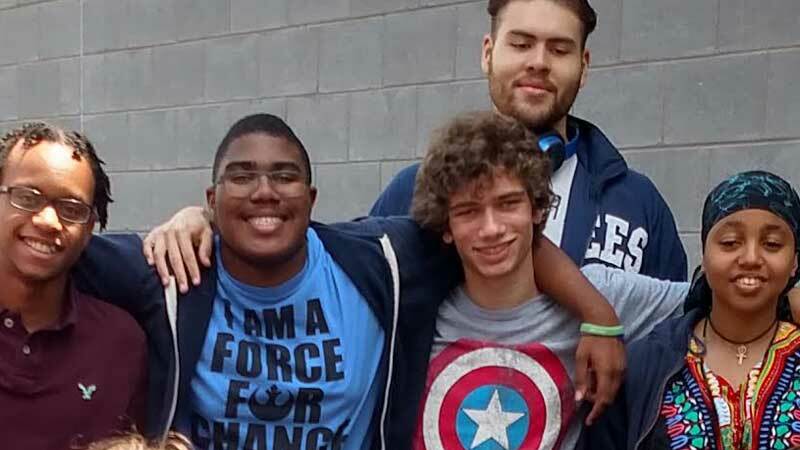 The Community High School Peer Leaders Horizon’s program had another fantastic year at Nyoda Hills. 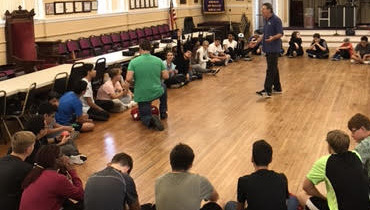 The day was packed with leadership and team building activities. After some engaging opening activities, our students were placed at several different courses to promote successful communication in order to achieve specific goals set by the amazing staff at Nyoda Hills. One of the most challenging activities is the Wall Climb. The students must work together in order to get every individual over an eight-foot wall. At the end of the day, every student has accomplished a confidence boosting challenge at Nyoda Hills. Community High School's celebration of Pi Day was delayed because of the snowstorm. 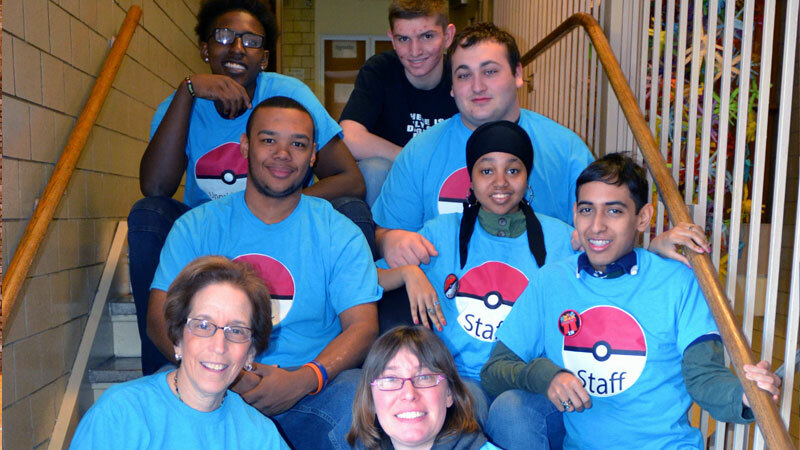 We celebrated Pi Day on Thursday, March 16th with a theme of “Pokemon.” The graphics department created “Pokemon” tee shirts and buttons that we used during the celebration and everyone wore their tee shirts on that day. Some of the activities included a “pi” scavenger hunt, the rubber band ball activity, and guess the number of gumballs in the jar. Within each math class we celebrated “Pi day” with many challenging puzzles and math activities. Everyone so enjoyed the spirit of the day because of the unity created by the theme and the activities in the math classes. This years seniors included Matthew Moskowitz, Jacob Behrle, Theorian Johnson, Charles Perez, Irving McMichael, Umar Rehman, Mathew Seel, and Jihad Abdul-Sabur. Pi Day was filled with enthusiasm and energy on the part of the faculty and the students. Pi Day has become a tradition at Community High School and is a day of learning and a day where students come together to learn about the excitement of numbers. It has become an integral part of our math department and every year the students look forward to this event. Happy Pi Day to ALL!!!!!!!! Julia Sheridan brought a unique set of talents to the Community Lower School when she entered in fifth grade; while she was struggling as a student, she was starring in athletics. 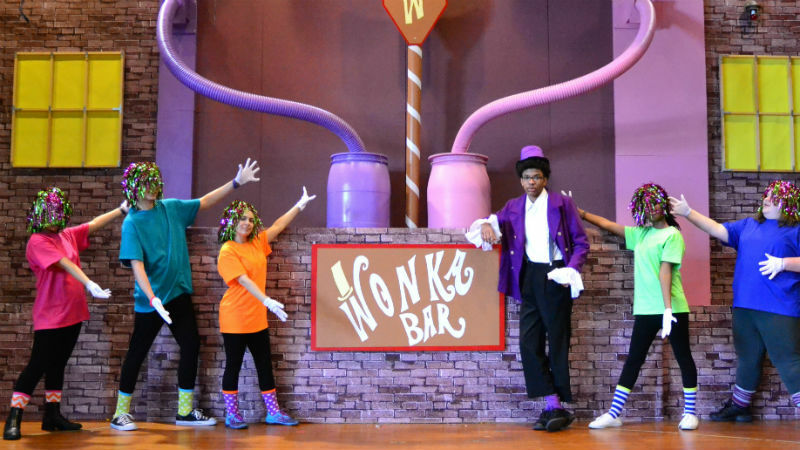 Everyone got their “Golden Tickets” and headed to Community High School’s Spring production of “Willy Wonka” on April 7! 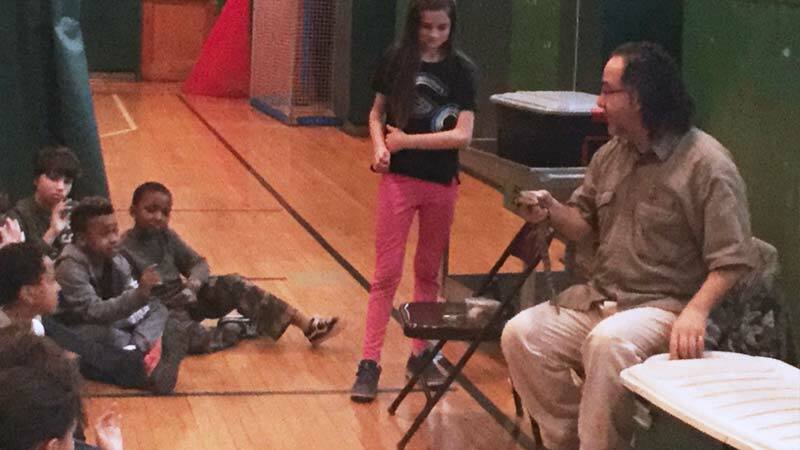 On March 28th The Lizard Guys came to the Community Lower School and gave a live presentation of various reptiles. A leopard gecko named Cream was introduced to the students. Then a blue-tongued skink was shown. A twenty-five-pound African tortoise from the Sahara Desert munched on an apple while we learned that they only look for food at dusk and dawn. Their shells do not protect them from extreme temperatures. They dig a hole to keep cool during the heat of the day and warm during the cold nights. The highlight of the afternoon was when a very large boa constrictor named Rocky Balboa was revealed. It was molting and the presenter took off some of its skin. He explained that most people think snakes smell with their tongues, which is incorrect. Snakes have two sets of nostrils. One set is on the outside for breathing and the other set is on the inside roof of their mouths. Their tongues are used to get the smell to the inside nostrils. As the students were leaving, they got to touch the boa constrictor and feel its soft skin. They really enjoyed learning about the reptiles. It was a very informative and entertaining presentation. On Wednesday evening, March 8th, the Lower School Parents Association hosted a webinar run by technology teacher and Community High School alum Seth Guttenplan (class of 2003). Seth showed parents how to monitor their children's grades and activities on Edmodo through Parent Accounts. Seth also delivered a tutorial on how students can log in to their Google accounts from home and access the Read and Write for Google Chrome tool, Learning Ally, and Reflex Math. The workshop was a huge success as many parents followed up with excellent questions and feedback. The Lower School Parents Association is looking forward to hosting more webinars about technology and other topics in the future.